Map It! 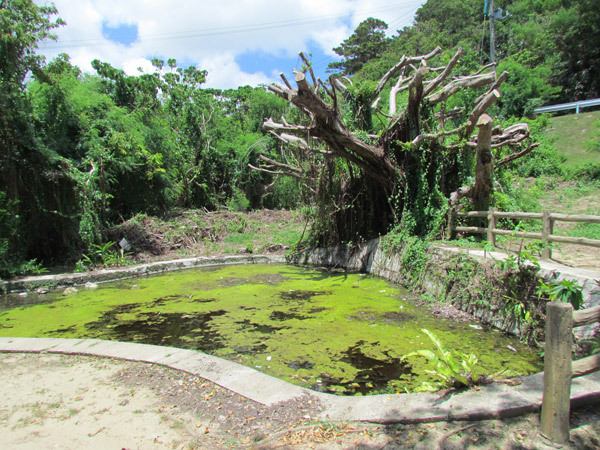 Okinawa: "The Park of Mysteries - Toguchi Village"
I call this 'The Park of Mysteries'. It is tucked away in Toguchi Village, just south of Awase. It is pretty hidden and not something you will see advertised on the main highways. It is in the northwest corner of the 81/329 Intersection. I call it 'The Park of Mysteries' cause there were a few structures of curiosity that had no explicit explanation or inscription next to them (PLEASE CLICK ON THE PICTURE ALBUM). The park is well kept which means someone must take care of it. I suspect that local volunteers in the village help with the maintenance. Mystery #1. There is this well structure with no inscription on it explaining its purpose. The well is only about a foot deep filled just with rocks and overgrown vegetation. I am not sure if this was a source of water at one time. (It is important to note that this structure may have no importance whatsoever. Someone could have just designed and made it that way). It looks relatively modern. Mystery #2. There is a pond with a what used to be a large tree hanging over it. The pond is now just stagnant water. But it flows to a nearby ditch. I am not sure if this was a spring at one time. The tree has been cut up for some time, and the only part that remains is a big chuck of its trunk. It looked like the tree was really big at one time and had some importance at one time. Mystery #3. There is a stone that erected next to a tree. It doesn't look like an ordinary stone. It almost looks like it was put there on purpose. No inscription was next to it. Part of the stone was broken. Again, it could be a coincidence that that stone happen to be there and shaped the way it was, but I don't think so. Mystery #4. Behind the park is a trail that skirts around to an 'Utaki' (Hogan, the Okinawan native language, for sacred place). There is an inscription with a heading that says 'Kumishi' in Katakana (Katakana is Japanese alphabet for non-Japanese words). Asking around, it is not certain what this means. It could be a Hogan word. Hogan dialects vary on the island as well. So an Okinawan from one part of the island may not know a Hogan word from another part of the island. Below the heading it says, "Birthplace at Atta Village". I believe that the utaki was created at Atta Village which is in Onna Village (opposite side of the island) and that it was later moved to Toguchi Village. My goal is to go back and find an elder from Toguchi Village that may know about these curious structures. I will come back and update this post on my findings. Other places of interest: You will see a set of steps from bottom of this park. If you take it up and veer right, you will run into 'Midori Park' or 'Green Park' about 100 meters away. 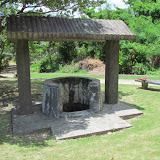 You will also see another War Memorial (Toguchi War Memorial) at the entrance of Green Park. I will blog about this real soon. Caution: Just be aware of low lying branches. You may see some of those big Banana Spider webs, particularly if you going on the trail to the mysterious utaki in the back. I wouldn't wear sandals. Wear some good shoes, especially if you decide to go to the 'Green Park' afterwards. 'Green Park' has some interesting side trails, but they are rugged. If you do go to 'Green Park', definitely watch out for the Banana Spiders. 'Green Park' is also built on a slight incline, so it is a little workout going through it. Parking. Look at the Green thumbtack in the map. Parking is tight. Keep in mind that the village next to the Mysterious Park has some very narrow roads if you try to go through by car (You shouldn't have to though). Toguchi Village is an Old Okinawan style of neighborhood. 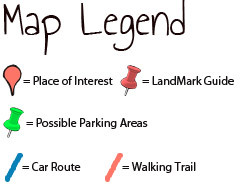 To access the Mysterious Park, you could do what I did and park somewhere near Highway 329 or 81 and walk to it. The Mystery Park of Toguchi is a small park, but it is quiet and serene. It's good to relax and just take a small part of Okinawan culture.